Ever wanted to drive off into the sunset in your very own camper, but can't afford to buy one? Now with the help of this easy to use, comprehensive 'diy' guide you can finally achieve your dream. 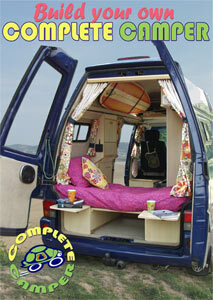 Complete Camper is a totally unique campervan that turns heads and boggles minds. It's often described as a tardis due to the never-ending features it offers. It was designed with comfort, flexibility, and self-sufficienty in mind, and if you decide to build one using our online tutorial, you can look forward to travelling in style...'slumming it' is not a phrase we are familiar with here at Complete Camper! The Complete Camper Toolkit will be your step-by-step guide, your 'man that can' to enable you to build and finally own your very own camper. It's perfect for hard-working folk with a dream for wanderlust, and for those who love to travel without having to sacrifice life's little luxuries!!! Invite adventure and discovery into your life! You can upgrade your order and get a physical DVD posted right to your door for an extra £12.99 +P&P £2.00 as well as the online Toolkit. The Toolkit will show you exactly what I did to turn an empty courier van, into an awesome home on wheels. It will empower and give you the inspiration and confidence to create your own little marvel. So, don't let the words 'do-it-yourself' scare you. There's no time to feel daunted when adventures are just around the corner! "The videos and photos speak volumes. The step by step video and encouragement to cut through the sides of the van were enlightening. I LOVE the bathroom! You make it all look very possible!" Debra de la Torre, New Mexico, US. "The Toolkit is a real inspiration for others considering the diy conversion route, and I thought the sliding washroom a work of genius! I am now itching to get started on my own conversion!" James Clancy, Brighton. The Toolkit is a complete package of video and media content. The video is 80 minutes long, split into 13 seperate streamed chapters. Once you're a member, you can take your time and absorb all the new techniques you will be learning over and over again! Also included in this package are a total of 20 downloadable pdf files.